This is where you will check in to the event and pick up your race number and race bag. Who needs to go to packet pick-up? All athletes who will be participating in triathlon or duathlon will need to pick up their packet for the event. You must pick up your packet if you are to participate in the event. All registered athletes MUST show photo ID when picking up packet. NO exceptions will be made. 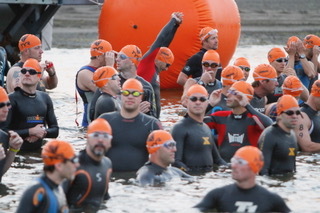 NOTE: You must be a current (non-expired) USA Triathlon annual member or 1 day member to race. No exceptions. Current USA Triathlon membership card. You must be able to prove your membership status with USA Triathlon. If you do not have your card with you, you will have to purchase a one day or annual membership at the event. No exceptions! Temporary cards printed from www.usatmembership.com will be accepted if your membership card is not available. If you have any problems printing a temporary card before the event, please contact the national office at 719-597-9090 or email [email protected]. How do I prove I am an athlete participating on race day? Athletes will be given a wristband at packet pick-up that must be affixed to your bike for the race. This wristband will allow athletes into transition at bike check-in and to pick up their bike after the race. No one will be allowed into transition without a wristband on a bike and your body marked with your race number. Athletes will need to be marked with their bib numbers on their arms and legs. Make sure you look for this when you pick up your timing chip. Athletes will check their bikes in event morning. Where is bike support located? Bike support will be available by Bert's Bikes and Sports transition to help athletes with mechanical issues. Athletes that have major mechanical issues on Friday will need to go directly to the Bert's Bikes and Sports store for assistance. Bert's Bikes and Sports can be found at 4050 Southwestern Blvd. Orchard Park, NY 14127. 716-646-0028. What if I can't make packet-pick up on Friday? Eclipse Multi-Sport understands issues happen. In these cases there will be race morning packet pickup available on site race morning. Race morning packet pickup will be open 2 hrs before the start of the race. What if a volunteer can't answer my question? Please go to the registration table and they will find someone to answer the questions you have. The registration table will be located inside with the packet pick-ups. What time should I get to race? Generally speaking, you should arrive at least 1 1/2 hrs prior to start time. Getting there early allows you to comfortably rack your bike, get your timing chip, get your body marked and stretch out.